On May 17, 2008 I went to Veggie Corner with Wayan Subakti. 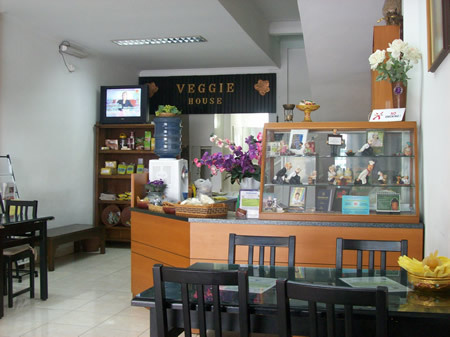 Veggie Corner is vegetarian restaurant in Denpasar, Bali, Indonesia. 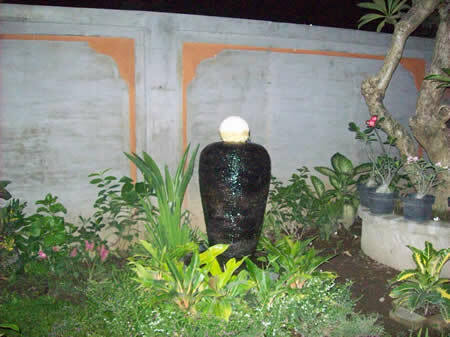 It is located at Jalan Imam Bonjol No. 133 Denpasar. Although it has not a large dining room, the restaurant serves domestic and international cuisine. At this time Wayan liked to have Nasi Goreng Seafood ( fried rice with “seafood” ) while I asked for Nasi Langgi ( rice with spicy Langgi, fried potatoes and sliced fried tempe ). At Veggie Corner Restaurant you can ask for vegetarian menu such as : Sate Oriental with peanut sauce, Grilled Soya, Fried Sealike Soya, Grilled Gluten, Fried Lakely Soya. The prices are about Rp 10000 to Rp 12500. It sounds reasonable for the price. The other vegetarian restaurant in Denpasar is Veggie House. It is located at Pertokoan Sudirman Agung B12A Jalan Sudirman Denpasar. The restaurant is clean and comfort with air conditioner and television set showing Supreme Master TV Program. Veggie House serves vegetarian pizza and burger such as: vegetable pizza, veggie soya meat pizza, veggie white pizza, veggie hamburger and veggie fillet burger. It use no egg mayonaise. 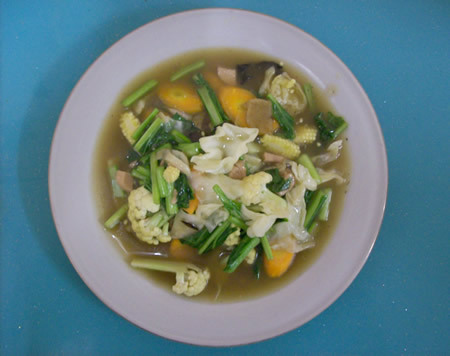 Some Indonesian vegetarian soups such as: baso veggie, baso veggie special, baso sawi kuah and baso kuning are available, too. I went to this vegetarian restaurant with Ramacandra. He loves to eat Nasi Goreng Omelet while I like to eat Nasi Goreng Oriental. 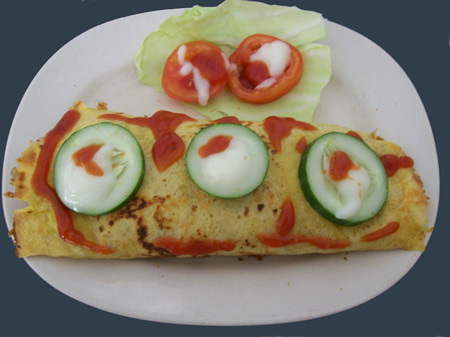 The picture below shows Nasi Goreng Omelet served by Veggie House. The fried rice is covered by the omelet. I guarantee you will be impressed too. The price is Rp 12500. At Jalan Cok Agung Tresna no. 108 Denpasar, there is a place you can dine. It name is Bodhi Veg Restaurant. This restaurant has different atmosphere with two restaurants I mention before. Bodhi Veg has a tiny but pleasant garden with fountain. I think that it is a right place to dine in. Bodhi Veg serves vegetarian menu without egg, garlic, onion nor mushroom. The menu items such as Ikan Bakar (Grilled Vegetarian Fish), Ayam Bakar (Grilled Vegetarian Chicken), Sayur Hijau (Mixed Green Vegetables), Spaghetti, Tempura, Udang Bumbu Pedas (Shrimp with Spicy Seasoning). If you go to Kuta or Tuban area, there is a vegetarian restaurant near the Ngurah Rai Statue in front of the Pertamina petrol station. It’s name is De Ra Sa Vegetarian, located at Pertokoan Graha Tuban Kav No. 6 on Jalan By Pass Ngurah Rai No 88 E, Tuban Kuta. De Ra Sa offers menu such as Nasi Bebek BBQ ( Rice with Vegetarian “Duck” BBQ ), Nasi Ayam BBQ ( Rice with Vegetarian “Chicken” BBQ ), Nasi Goreng Seafood ( Fried Rice with Vegetarian “Seafood“ ), and Seaweed Soup, and other Chinese Vegetarian Cuisine. 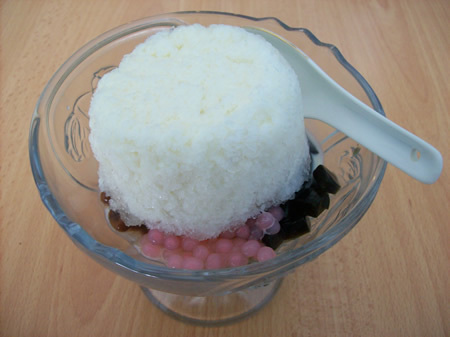 De Rasa also offers special drink named Momocaca Ice. The price is Rp 7800. I like it very much. On June 7, 2008 I went to Chai Ken Siang Vegetarian Restaurant with Ramacandra. 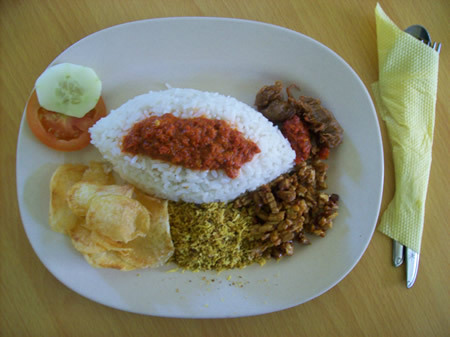 The restaurant is located in Jalan Teuku Umar Barat No 9X Denpasar, in front of Super Ekonomi Supermarket. Chai Ken Siang Vegetarian Restaurant serves daily special menu, that is: Rawon Vegetarian on Monday, Soto Babad Vegetarian on Tuesday, Pangsit Mie and Bakso on Wednesday, Nasi Campur Khas Bali on Thursday, Soto Ayam Veggie on Friday and Sate Gulai on Saturday. This restaurant is equipped with air conditioner so you won’t get sweat while you dine. At those time, we have had Kolobak and Cap Cay Goreng. It cost Rp, 8500 for Kolobak and Rp 8,000 for Cap Cay Goreng. In my opinion, this restaurant serves delicious Chinese and Indonesian cuisine. 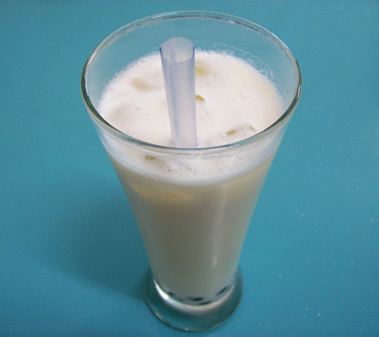 Chai Ken Siang Vegetarian Restaurant also serves special beverage named with Teh Susu Mutiara Asli Taiwan (Tea and Milk with Taiwan Pearl). Ramacandra and I like it very much. I love to be a vegetarian since vegetarian and non violence is a secret precept for attaining everlasting life.